I’m blue, daba-dee, daba-dah. WisCon uses blue painter’s tape to mark areas of the convention space for various users, including squares on the floors of panel rooms for wheelchair parking, slashes on chairs near the fronts of panel rooms for those who who need to be close to hear or see, and 6th-floor aisle markings to keep travel lanes clear. It takes volunteer power to mark and upkeep these markings throughout the convention. If you’d like to help with the Blue Tape Crew, please sign up by filling out our online form, or emailing access@wiscon.net. Oo oo, that smell. WisCon asks con-goers to please consider those with allergies or chemical sensitivities by minimizing strong scents at the con, be it perfumes, incense, cigarette smoke, or similar. Unfortunately, the convention space is not a fragrance-free zone, but WisCon takes steps to minimize strong scents, including providing scent-free soaps in the restrooms. Keep these practices in mind when donating clothing to the Gathering’s clothing swap—washing donations with scent-free detergents before the convention will make the swap more awesome for everyone! In my room, in my room. WisCon can be overwhelming at times, so we offer a Quiet Room on the 2nd floor where attendees can get some peaceful respite. We also offer three Safer Spaces rooms for people of color, people with disabilities, and people who are trans/genderqueer. Other relaxing escapes are available, like sitting in on a reading or taking a stroll through nearby parks. I like to eat, eat, eat, apples and bananas. Don’t let the hanger consume you; consume some of WisCon’s goodies instead! We try to accommodate as many eaters as possible, whether vegetarian, vegan, gluten-free, or just on a tight budget, we have plenty of options for you. The Friday Bake Sale, Sunday Dessert Salon, and free snacks and meals at the Consuite will have major allergens marked, but are not entirely nut-free if you have severe allergies. I got two turntables and a microphone. WisCon works hard so that everyone can read and listen how they read and listen best. We offer CART captioning at the Guests of Honor speeches and at select panels, as well as limited ASL interpreting. With a heads-up before May 1st, we can also provide large-print or Braille versions of our Souvenir Program Book. Larger panel rooms are equipped with microphones, and we remind our panelists not to cover their mouths when speaking, for the benefit of audience members who lip-read. Descriptions of the visual components of panels will benefit audience members who are blind or low-vision. I like to move it, move it. WisCon wants to make it as easy to get around the convention space as possible. Because events take place on multiple floors, many attendees use the hotel’s elevators to move around. If you can take the stairs, please do, to alleviate traffic to the elevators for those who need them! Additionally, WisCon provides shuttles to our off-site Thursday night reading. We encourage a visit to the Welcome table at the Gathering on Friday to learn more about getting around the convention. Can you feel it, can you feel it, can you feel it? This WisCon 42 will be the convention’s first year offering a Tactile Art Tour of our Art Room. With a dozen artists participating, we’re excited for a new way to experience the art showcased at the convention. Details are still being ironed out, so stay tuned! Questions? Concerns? Forget to request an accommodation, or want to make a suggestion? Email us at access@wiscon.net. We look forward to creating a stellar experience with you at WisCon 42! Greetings from your friendly neighborhood Workshop department! Did you know that beyond the panels, panels, and more panels that we are all SUPER EXCITED ABOUT, there’s even more WisCon out there for you? We’re talking about Workshops! Workshops are more responsive, participatory sessions, and while some require preparatory work on your part, some of them are very drop in! Read below to find out offerings this year, or click here for more general information about how Workshops, um, work. If you’re interested in signing up, read the descriptions and email workshop@wiscon.net! But wait, there’s more! Our special sessions are pretty great this year. Some require signing up ahead of time; others will be open for drop-ins. These salons are open sessions and will be led by facilitators who can offer advice and hands-on assistance whether you’re a beginner or just looking for a space to get some work done. These will be in the schedule once it’s out, so don’t forget to look! These sessions require sign up prior to the workshop. Sign ups for these workshops are open until May 21 or until all slots are filled. Email workshop@wiscon.net to reserve your space! These workshops do NOT require sign ups so feel free to drop in! You can also email workshop@wiscon.net to reserve a guaranteed space and help us anticipate attendance. The clock is running down on your time to nominate a Guest of Honor for WisCon 43 in 2019! We opened nominations back in May during WisCon 41, and you have until Sunday, October 15, at 11:59pm Central Time to send in all your wildest dreams of who you’d like to see us spotlight. Don’t talk yourself out of sending us your thoughts! It’s easy, and nominations for Guest of Honor can come from anyone. That means whether you’ve been to WisCon forty-one times, one time, or maybe you’ll come someday in the future, we want your nominees. As long as WisCon is important enough to you to send an email, your ideas are important to us. Our Guests of Honor help shape and focus our programming, influencing our conversations at the convention and afterward, so we welcome nominees who have something to say about the world, science fiction, fantasy, and elements of inclusive intersectional feminism as described in WisCon’s Statement of Principles. Guests of Honor can be essayists, critics, artists, reviewers, fans, authors, musicians, scientists, performers, or none of the above, so long as you think they fit the bill. To make a nomination (or ten, or more), send an email to gohnoms@wiscon.net. We’d love to hear your reasoning, but that’s not mandatory. We’ll make a list of all of the nominees on October 16, and the convention planning committee will take a series of votes then extend invitations to the top candidates. We’ll announce the WisCon 43 guests during WisCon 42 in 2018, and then this whole process will start again. More questions about Guests of Honor and the whole process? We’ve got lots of details in last year’s version of this blog post – just don’t forget that the dates have changed. Happy nominating – we can’t wait to hear who you want to invite! Please don’t forget to turn in your plastic badge holder at the Registration desk. While you’re there grab one of our Souvenir Books! Enjoy a day of relaxing in Madison if you’re staying today, and safe travels if you’re leaving. We all had a great time this weekend, and we can’t wait to see you again in a year. Hope you can join us! We are overjoyed to announce that our Guests of Honor for WisCon 42 are Saladin Ahmed and Tananarive Due! Want to join us? Memberships and hotel reservations are open! 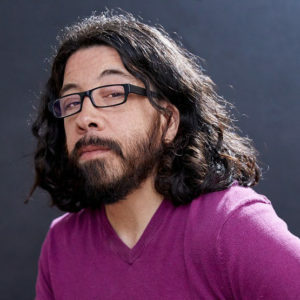 Saladin Ahmed (Photo by Al Bogdan). We’ll miss you, too!!! Please keep in touch! Sign up for our email newsletter (eCube), or follow us on social media. Have one last question? Want to register for WisCon 42? Lost something over the weekend and hope someone turned it in? The Registration desk is open until 1:30pm. You still have a few more hours to visit the Art Show, Dealers’ Room, and the Con Suite. And get your drabbles in to the Drabble Challenge! Come to the SignOut, a signing party and WisCon farewell rolled into one! Writers and those who love them will gather together to sign and get signatures, to thank and praise and schmooze one last time before we fly away for another year. If you’re still here on Monday night, come join others who are still here for a Fond Farewell party. We’ll have munchies, beverages, and good conversation. It’s the last party for WisCon 2017! It’ll begin at 8 PM and run until the last fan falls over. We are overjoyed to introduce our Guests of Honor for WisCon 42! Saladin Ahmed was born in Detroit. His novel, Throne of the Crescent Moon, was nominated for the Hugo and Nebula awards, and won the Locus Award for Best First Novel. His poetry and short fiction have been widely anthologized, and his nonfiction has appeared in The New York Times, BuzzFeed, and Salon. He is currently writing “Black Bolt” for Marvel Comics. 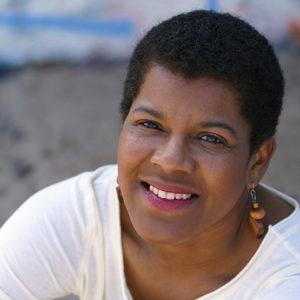 Tananarive Due is a screenwriter and an award-winning novelist who teaches Afrofuturism at UCLA. She also teaches creative writing in the MFA program at Antioch University Los Angeles and for Voices of Our Nations Arts Foundation (VONA). She was the former Distinguished Visiting Scholar at Spelman College. Due, an American Book Award winner and NAACP Image Award recipient, is the author of twelve novels and a civil rights memoir. She received a Lifetime Achievement Award in the Fine Arts from the Congressional Black Caucus and has been named to the Grio100 and Ebony Power 100. Her short story collection, Ghost Summer, won a British Fantasy Award and was nominated for an NAACP Image Award. In 2013, Due and her husband/collaborator Steven Barnes co-wrote a short film, “Danger Word”, based on their YA zombie novel Devil’s Wake, which they co-produced with director Luchina Fisher. Starring Frankie Faison (“The Wire,” “The Silence of the Lambs”) and Saoirse Scott, “Danger Word” was nominated for Best Narrative Short at the BronzeLens and Pan African film festivals. HOW IS IT SATURDAY ALREADY??? But don’t worry, WisCon’s not even half over yet. Today we have the Bake Sale, a Magic the Gathering Tournament, and the Tiptree Auction. Plus, y’know, tons of panels and readings and parties and … and … and …. Don’t forget we have a Quiet Place if you need a break! And if you need a snack, please stop by the Con Suite! It’s for anyone who needs it — whether to make your con more affordable or because your blood sugar is dropping or just because you’re getting hangry between panels! Con Suite needs a ServSafe certified volunteer 3-4pm today. Stop by the Con Suite (room 638). Art Show has hour-long shifts available all afternoon. Stop by the Senate rooms on the 1st floor. The Bake Sale needs help with sales. Stop room 627. WisCon is proud to offer live-captioning services — available all weekend long, at request, for (almost) any panel. We always offer the service for Opening Ceremonies, the Tiptree Auction, and the Sunday night Guest of Honor Speeches. But would you like to have CART for a panel you’re going to attend? Our CART providers will be hanging out in the Green Room (2nd floor) all weekend long. Check with a Green Room volunteer to see if the CART provider is available. Or you can email access@wiscon.net! We’re looking for a moderator for the “My Voices, Your Voices, #ownvoices” panel on Sunday at 10am. Unfortunately, the scheduled moderator wasn’t able to make it to WisCon this year. If you can step in, please contact the Green Room on the 2nd floor! How do I join the WisCon organizing committee, and what even IS that??? WisCon is run entirely by volunteers, but who are these attractive people and what the heck do they do? Please join us for some spontaneous programming where we’ll demystify these and other questions! There will be a teen-and-up Open Swim with a lifeguards on duty both Saturday and Sunday 2:30-3:45pm. Join us on the 3rd floor! Have a reading or party at WisCon that you want to advertise? Want to get the word out about some Spontaneous Programming you’ve planned? You can make a poster to hang around the convention space. Flyers in the stairwells can be posted NOW (previously some folks had been told they had to wait until Sunday — we apologize for the confusing information). You can also post your flyers and posters on the 2nd and 6th floors around the elevators but not IN them. 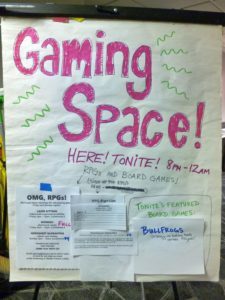 Signs on the 1st floor can ONLY be posted on the bulletin board — except for things officially from WisCon Access. Today’s a great day to take a stroll through our Art Show and Dealers’ Room. And don’t forget to cast your vote in the Art Show awards by 6pm tonight! Every year, WisCon hosts a bake sale to support and raise money for the Tiptree Award. A wide variety of cookies, breads, cakes, pies and delectables are baked and donated by Tiptree supporters. Do feminists have a sense of humor? Come to the Tiptree Auction and find out! You might come away with a first edition signed by LeGuin, a glow-in-the-dark squid, a statue of Space Babe, or a book from Alice Sheldon’s library. It’s never the same show twice, and whatever happens, there are always lots of laughs, all for a good cause. Every bit of the money you spend is donated to the James Tiptree, Jr., Award. Want to sign up for tonight’s games? 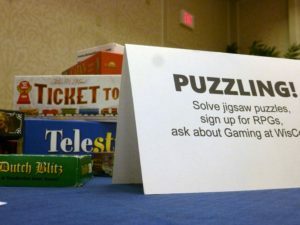 Email gaming@wiscon.net. For full descriptions of the games, check out this blog post.